This is a graphical "progressive" representation of "evolution" presented as "FACT!" from the purveyors of the Religion of Darwinism. Please ignore the very real fact that ALL of these pictured thingies actually still EXIST. It is absolute PROOF of the progression and the "evolution" of species. Ignore the fact that since Darwin proclaimed loudly and WRONGLY that the "Theory" of Natural Selection answered man's origins, there should be some kinda dying out of the species that are not MOST FIT. A modicum of proof of any scientific hypothesis should be necessary for it to be accepted as a theory. Of course, evolution's "proof" lies in nothing but comical lunacy. Well, if you think that it is funny that your kids are being lied to. How exactly did Darwin's ridiculous theory become common place in our "educational" facilities? It was FORCED upon our kids by none other than the ACLU with the court battle of State v. Scopes in 1925! Before Scopes, Darwin's "theories" were laughed at, like they are now by thinking people that have a minimum of math and science learning under their belts. 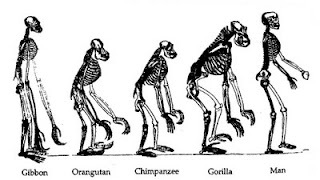 Sidebar: Darwin published On the Origin of the Species in 1859. Scopes went to trial based on SCIENCE! that was fully sixty-six years old at the time. Perspective? Surely. The very first reported case of AIDS was in 1981. HIV was probably first released in the wild in 1969. So at most, forty years. We have yet to cure AIDS, yet Darwin's "evolution" theories are taught as fact. It took a mere ONE YEAR to determine the cause of AIDS, yet in 159 years there is still not a single shred of evidence to give any credence to Darwin's "theory." Good enough? You see, the whole trial was an utter farce conceived to drum up publicity for a little podunk town in Tennessee with a population of about 1800 at the time. To this day, Dayton has less than ten thousand people, so the ruse was not successful other than completely ruining the education of our children in regard to science. There are plenty of forty year old adults today that still believe in the stupidity that Darwin preached and they shall never be convinced that it was a scam because they absolutely have to believe there is no G_d. People who actually believe in Darwin's "theory" of natural selection are the very same people that laughed at Christopher Columbus went he set sail to prove that you could reach the Indies by sailing West. Of course, since Columbus did not PROVE that you could actually do that, the Darwinists still think that the Earth is flat. Ignore that Columbus actually did NOT sail off of the edge of the Earth, he did not PROVE what he set out to do. Do you understand Leftist science, now? Another fun fact about Scopes was that it was a vehicle to revive the dying careers of William Jennings Bryan and Clarence Darrow. Bryan, a Democrat, was the "prosecutor," and Darrow, a Democrat, was the "defense" attorney. Darrow also worked for the ACLU at the time and was "agnostic." Bryan was "against" Darwinism because he thought that the ideology behind the "evolution backers" caused World War I. In other words, you have two folks of the very same ideological stripe fighting on "opposite" sides. In a stroke of irony, G_d chose to take Bryan five days after he "won" the case, so Bryan's career was literally NOT SAVED. What you had in Scopes, were two attorneys, a dried up town, and some ACLU money that predetermined the outcome of SCIENCE! for minimally eighty-four years now. You know, not unlike what you are seeing with the "scientists" involved in covering up their fraud with Climategate. In a serious world, instead of one run by the anti-intellectual crowd, science would be a study of opposing theories that were actually tested by folks that were open-minded, serious, and wanted to arrive at the truth. Have your children even heard of Michael Behe? Of course not, he has posited theories that the Darwinists cannot dispute. What about William Dembski? No again, he has performed mathematical studies showing evidence of intelligent design that the Darwinists cannot even UNDERSTAND. Both of these gentlemen have been ridiculed by those on the left that cannot even fathom there might be other explanations for the origin of man, other than a theory posited by someone in 1859. Ridiculous. There is an even seedier side of the Darwinists ideology. Eugenics. Remember, nothing is mutually exclusive. There is a profound reason why the Darwiniacs must eventually be proven right. They are the very same folks that have always taught us that the European white people are the height of humanity, yet man is the root of all that is wrong with the Earth today. Their underlying goal is not the scientific solution of where man originated, but where they can engineer man to go and their forced destruction of the human species. Yes, Darwiniacs are the pro-abortion folks, the Anthropomorphic Global Warming folks, the Cap and Trade folks, the population reduction folks, and the folks that are totally for an engineered society that are striving for Utopia. Please ignore the fact that their version of Utopia does not include living humans, which is kinda stupid because that would UNPROVE everything that you have been taught about Darwinism. BUT! Frank J. offers the "scientists" rebuttal. UPDATE: I received a comment from bobxxx on this post that stated, "Wow mister. I never saw so much stupidity in one place." Please know that there is nothing in this post that can be disputed at all. This is NOT an opinion piece, bobxxx. Not only that, but Jack Cafferty of CNN actually proved my point entirely today by supporting China's 'one child' policy to combat Anthropomorphic Global Warming. Dang, I love liberals, they are hilarious in their ridiculousness and ignorance. G_d bless 'em. LOL...the Nazis were into eugenics, social engineering and command/control government, just like the progressives seek. The similarities just keep piling up. Wow mister. I never saw so much stupidity in one place. Bob, I appreciate your honesty. Too bad there is nothing that can be disputed in this post. bobxxx either lied or hasn't grasped the truth here, but perhaps one day he will: he sees a monumental amount of stupidity every day, with a look in his mirror.